Formerly known as the Bridgers Mansion, the Graystone Inn was built in the early 1900s by Elizabeth Haywood Bridgers and is one one of the most elegant structures and historical landmarks in Wilmington today. Located in the heart of the North Carolina town, the Inn has recently been restored to its former tur-of-the-century glory and offers luxurious accommodations, first-class amenities, award-winning cuisine, and gracious hospitality and service. The Graystone Inn features nine beautifully appointed guest rooms and suites with king or queen-sized pillow-top beds dressed in sumptuous Egyptian cotton linens, European Matelassé coverlets, and down-alternative pillows. 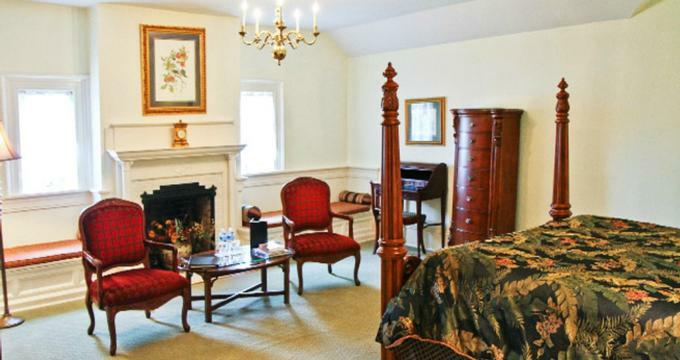 Each room and suite have a private en-suite bathroom with shower and bath combination, luxurious Gilchrist and Soames bath amenities and luxury Graystone Inn robes. Modern amenities include flat-screen HD televisions, direct dial telephones, hair dryers, irons and ironing boards, and complimentary wireless Internet. The elegant Bellamy Junior Suite can be found on the private third floor and is beautifully decorated in subtle yellow and green with antique and period furnishings. A king size bed is dressed in sumptuous Egyptian cotton linens, European Matelassé coverlets, and down-alternative pillows and an en-suite bathroom have a walk-in double shower and champagne tub, luxurious Gilchrist and Soames bath amenities and luxury Graystone Inn robes. A spacious living area boasts a fireplace and built-in side window seats with beautiful garden views. Located on the third floor, the Bellevue Junior Suite boasts glorious 18-foot ceilings, walls decorated with French toile wallpaper and a four-poster king size bed dressed in sumptuous Egyptian cotton linens and European Matelassé coverlets. The spacious living area has a Victorian fainting couch, and the en-suite bathroom has a Victorian claw foot soaking tub and a separate large walk-in shower for two. The Burgwin Wright Junior Suite is decorated in soft greens, corals, and cream and features a spacious sitting area with original built-in window seats, a comfortable sofa, a writing table and chairs, and a fireplace. A romantic four-poster king-size bed is dressed in sumptuous Egyptian cotton linens, and European Matelassé coverlets and an en-suite bathroom offer a Victorian claw foot soaking tub with double shower and luxury Graystone Inn robes. The remaining six guest bedrooms are all beautifully appointed and furnished in antique and period décor and furnishings, with king or queen-size beds dressed in sumptuous Egyptian cotton linens, European Matelassé coverlets, and down-alternative pillows. En-suite bathrooms offer Victorian claw foot soaking tubs and/or walk-in showers for two, luxurious Gilchrist and Soames bath amenities and luxury Graystone Inn robes, and sitting areas feature fireplaces, sofas and large windows with gorgeous views. The Graystone Inn serves a delicious breakfast in the English Manor-style dining room every morning, which includes fresh chilled juices, locally roasted coffee, homemade bread, freshly baked pastries and muffins, and fresh fruit and yogurt to start. This is followed by a full, hot, plated breakfast which is made to order and includes a daily Chef’s special such as Blueberry Johnny Cakes, Eggs Benedict, Ginger Pear Pancakes, and Key Lime Stuffed French Toast, as well as a range of different savory hams, sausages, frittatas, and quiches. Breakfast is served to soft music and candlelight, and vegetarian, vegan, gluten-free and diabetic diets are accommodated for. Coffee, tea, beverages, and snacks are available throughout the day in the beverage center on the first floor. The Graystone Inn offers a range of first-class amenities and services, including concierge services, a daily newspaper service, complimentary snacks and beverages 24 hours a day in the inn's beverage center, and a complimentary wine and hors d’oeuvres reception every evening by the fireplace in the parlor. A delicious breakfast in the English Manor-style dining room every morning, and guests can purchases mementos of the Inn such as the locally ground coffee and luxury bathrobes. The Graystone Inn offers an elegant location for weddings, receptions and other special celebrations. The historic 1905 mansion boasts the grandeur and grace that makes for an elegant and stylish location for destination weddings and features various venues from which to choose for ceremonies and receptions from the Grand Hall to intimate garden settings. The 4,300-square-foot space on the main floor of the Inn can accommodate up to 150 guests with ample space for a dance floor and musicians or DJ, and the Inn offers a variety of wedding, elopement and reception packages to suit every need.